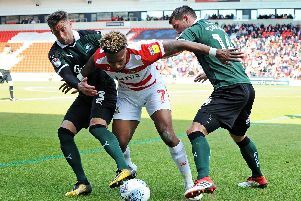 Darren Ferguson will continue to rotate his squad during the climax to the season. The Scot made five changes for Saturday’s 1-0 defeat to Oxford United and he will freshen up his team again for the visit of Blackburn Rovers to the Keepmoat Stadium tomorrow. “I don’t think I’ve got much choice because the games are coming that thick and fast,” said Ferguson. “At any stage of the season if you’re going Saturday Tuesday for three consecutive weeks that is going to be hard, let alone this part of the season. “Coppinger needed a break. There was no way I could play him in every game if I’m going to get the best out of him. “Beestin felt his hamstring. I had to make a decision between Baudry and Boyle and I picked Baudry because he’s played with Butts so many times previously and he gives us that composure on the ball at the back. “Alcock and McCullough were fresh, and I can’t play Houghton every week. “So they were quite obvious decisions to make because I know daily how the players are feeling. I knew I needed a freshness in the team. “Now that gives me the opportunity to freshen it up again on Tuesday. “Quite honestly, I’ll be surprised if I’m not doing that every game now. I think I’ve got to utilise the squad. Tommy Rowe, who also missed Saturday’s game, faces a race to be fit for the new season after having an operation on a hamstring problem.